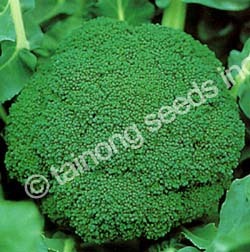 Broccoli 西蘭花 | Tainong Seeds Inc.
Cross between Kale and hybrid broccoli. New Hybrid with heat tolerance for summer. 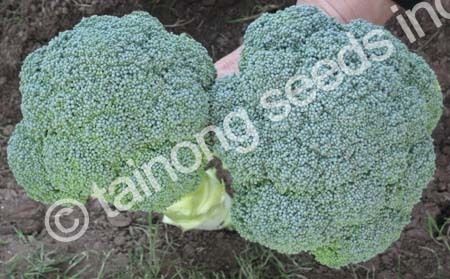 Extra early maturity 50~55 days after transplant or 80~85 days after sowing. Dark green color, smooth dome shape with medium fine bead size. High domed heads are firm, compact, smooth with fine bead size. Maturity in about 75~80 days after transplant or ~105 days after sowing. Medium to large plant size. High dome, small bead, heavy head for high yields. Blue green color, small fine beads, domed head, medium tall plant. Maturity in 97 days after sowing. Tolerant to Foliar downy mildew. 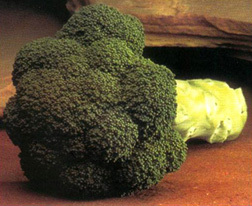 Improved uniformity and size in cold over-winter production.